I bought this tablet for its size, economical price point, and the ability to watch content offline. And it offers exactly that…but falls short on performance parameters. If you’re price sensitive and are looking for a value tablet, large screen, and the ability to watch content offline, this is a great device to get. 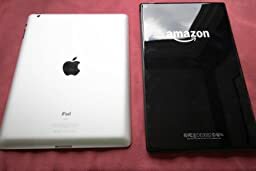 However, if you already have an earlier Kindle like the HDX 8.9 or even an earlier version of the Fire, I recommend keeping your tablet since this device wouldn’t really be a worthwhile upgrade. I have been disappointed with several operating shortcomings of the device. all factors made this a frustrating device to own . The HDX is far better in every aspect, heck even the original Fire 7 runs better than this device. The only good things about this device are the screen size and the MicroSD slot. So if you’re only watching videos on this, and would like to have the option of watching content offline when you’re traveling, this tablet would be just fine. Otherwise, the HDX is still a better option, or you could get the 7″ or 8″ Fire models. Those are priced cheaper and work better. For the price point and size alone, the Fire HD 10 would seem like a good deal. For its performance, however, it falls short of expectations. I would probably rate it a 3.5 overall. If it wasn’t for the price, the rating would have been even lower. This is a value mid-tier device with a screen size that is good for videos, but the tablet’s weight makes it cumbersome for reading books, and it has a number of flaws that need to be ironed out with (hopefully) future software updates. 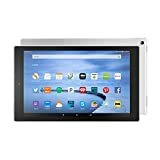 PROs – Price, speakers, picture quality is great, good screen size for watching videos, expandable memory slot (great for viewing content offline), good mid-tier tablet specially for watching videos. CONs – Lags significantly when switching or starting/closing apps (runs fine once an app is open), battery life is horrible, tablet size makes one-handed reading difficult. Meant to be a mid-tier tablet and it is exactly that. The device is claimed to be “Designed for Entertainment” – true, but I would also add “Not designed for performance”. FORM FACTOR – The tablet is thin and light, doesn’t feel like such a large tablet given its thin form factor. 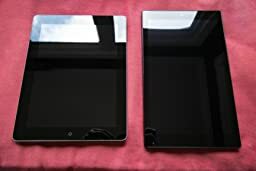 The device measures 10.3″ x 6.3″, slightly taller and narrower than the iPad Air which is 9.4″ x 6.6″. The screen when viewed in landscape mode is great for videos. Apart from the increased size, it feels sleeker and less boxy compared to previous Fire models. However, one-handed reading is not very comfortable on this device specially with a case on it. SPEAKERS – The dual stereo speakers are superb, definitely one of the finer points of this tablet. At full volume, this tablet is loud (even with Amazon’s case on it which has a cutout for the speakers). I have always preferred to use NR headphones to watch videos since I feel they deliver better sound quality, but the speakers on this tablet eliminate the need for headphones, the sound is just that good. Note that give the location of the speakers, the sound may get slightly muffled if you’re sitting in bed watching videos in portrait mode, since softer surfaces will come very close to the tablet. EXPANDABLE MEMORY – The tablet comes with a MicroSD card – a very useful feature to have particularly when traveling or if you wish to watch content offline. Accessing the card slot is a little tricky, but once I was able to get it in the slot, it has been sitting in the slot securely. With the ability of viewing offline content viewing with Prime membership, you can download and watch movies and shows even when Wi-Fi isn’t readily available. This makes the microSD card slot a very welcome addition, especially for long trips. I’m glad this feature is finally available. SCREEN – The screen is made of gorilla glass, similar to previous Fire versions. The display is 1280×800 which looks sharp, technically short of most tablet specs, but it looks good. For comparison purposes, the Fire HDX 8.9 has a 2560×1600 display. I pre-ordered mine and was super excited to receive it promptly on Sept 30th, I ordered a case as well as the san disk of which I have yet to receive, no problem anyway don’t need it as I’m returning my tablet. Huge disappointment to say the least, I have the second generation tablet fire HD7 and the Fire 8.9 both excellence products so I had high expectations for the newest member the fire HD 10~ first issue I encountered was the power button I had to push the button 4 times before it would fire up, then there was a problem with installation and backup, I have a lot of books and music on my original fire HD7 tablet it being my first kindle tablet I made the most of it I have to say I have never encountered any issues that couldn’t be fixed and am still enjoying to this day. the second issue with the fire HD 10 was loading, freezing, connection, and re-start issues, I have the same games on my fire HD7 and 8.9 DHX kindle when I installed the same game to the fire HD 10 I encountered loading, freezing, lost connection and re-start issues, I had to call customer service to load my books and the tech guy of whom I had to talk to in costa rica was difficult to understand I had to keep asking him to repeat himself, it took a very long time and I was instructed to do a hard re-set only after a few times did we manage to enable the books to download before that I couldn’t open them, I called customer service the next day and asked them to send me out another fire HD 10, I explained the issues I was encountering with the fire HD 10 and she had another sent out the very next day I thought maybe I got a dud Hey! it happens! I needed to compare the new one which BTW was delivered in a soft brown wrapper instead of a box and the packaged was torn thank you!! :( I let the new fire HD 10 go through the cycle of downloads and backups which I thought went more smoothly then the first fire HD 10 that had been sent out I also fired up my fire HD7 and the 8.9HDX so I had 4 tablets going of course my first 2 gave me no problems what so ever (I knew they wouldn’t) then comparisons to all 4 in terms of loading and connection issues both fire HD10 failed to meet the standards that the new fire HD 10 claims, I’m returning both plus the case when Amazon comes to their senses and redesigns the fire HD 10 to comply with the claims they make then I’ll just leave well enough alone. and what’s with the power button? its like you need to hold it before the tablet will fire up and compared to my second generation fire HD 7 and my 8.9HDX this one failed, sorry Amazon you’ll have to do a heck of a lot better than the fire HD10 before I shell out big bucks for another dud!! I’ve been a prime member for a long time and enjoy the many benefits, I’m only giving you my honest opinion. if you revamp the fire HD10 I might give it another try but for now I have to pass, and having customer service send out another one to help me figure out if it was just the first one being a dud or what now I know. thank you for reading my review and to those who make the decision to buy one hope it works out better for you than it did for me. sorry for any miss-spelled words hope you understood what I was trying to convey.